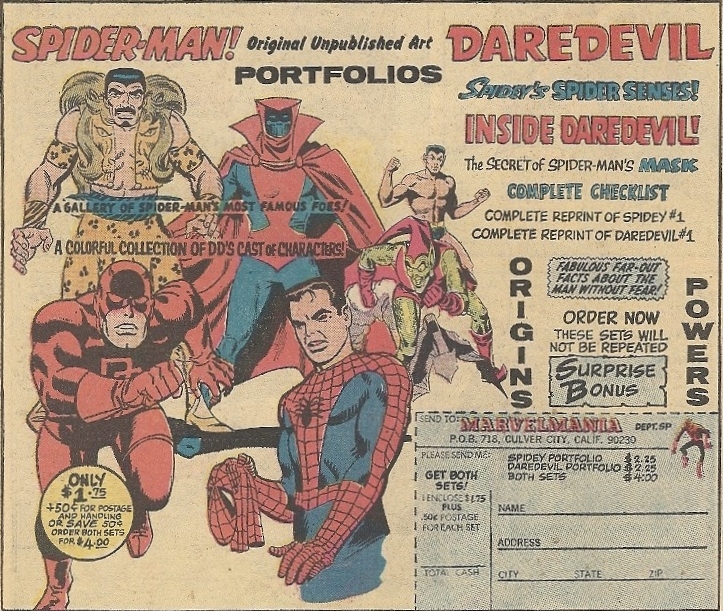 Buy some of the old Marvel portfolios and further exploit the artists! While it’s nice that Marvel wanted to give readers access to unpublished art from some of their most popular bullpen members, retrospect casts a different angle on this old Marvelmania offer. Considering the trials of tribulations over the years of artists trying to get credit, royalties and access to their original artwork, you get the feeling that Marvel was picking these guys up by their ankles and shaking them until all the loose change fell out. Running their pockets, as it were — in the Mighty Marvel Manner. Wood, Romita and … I think that Daredevil in Romita not Colan. No Kirby.